This summer University of Michigan-Flint Social Work associate professor Elizabeth Collardey led a group of young men living at the Thumb Correctional Facility in Lapeer, Michigan through the intricate paper folding process of making 1,000 origami peace cranes. A dozen 17 to 22 year-old youthful offenders, who are serving varying sentences at the Lapeer facility, participated in the arts enrichment pilot program. 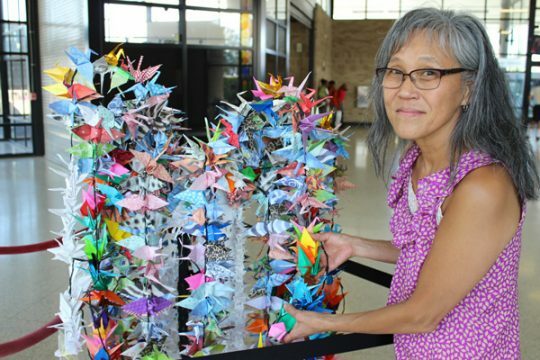 Now through December, members of the public can enjoy the group’s colorful peace cranes on display at Flint’s downtown MTA bus station. 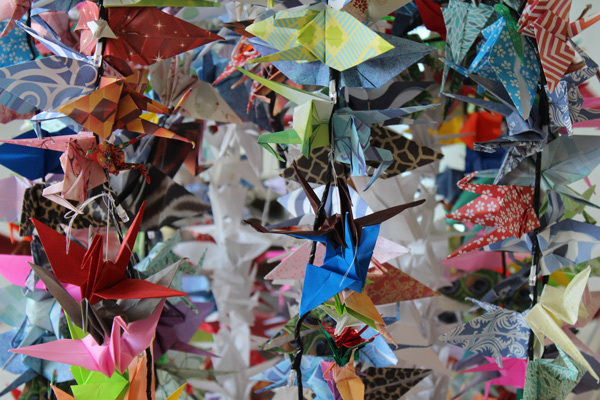 The small paper cranes were arranged on a tree structure in the lobby of the MTA building with assistance from UM-Flint University Outreach and Traci Currie, UM-Flint Communications and Visual Arts lecturer. The beautiful public exhibit serves as a visual reminder of everyone’s responsibility to take time to understand other people, show compassion, and strive to live in peace with one another. 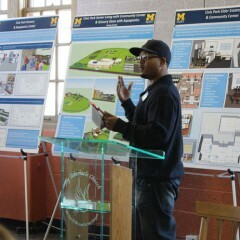 In years past, Collardey worked closely with youth at the Colorado Division of Youth Corrections. This summer seemed to be the right time for her to pilot this program at the Thumb Correctional Facility and once again positively influence youth while supporting their goals for self-improvement. Origami peace cranes created by young men at Thumb Correctional Facility in Lapeer, MI. Two young men who participated in the pilot peace program at Thumb Correctional Facility reflected on the class and what they learned by providing handwritten feedback to questions about the project. Due to confidentiality and facility restrictions, their names were not released for print. An 18-year old man living in the facility explained that he grew up in a small town and enjoys nature, helping people, and building things. He appreciated Collardey’s step-by-step instructions in the class. A 20-year-old man originally from Lansing, who has his GED, reflected on how his interest in art and working with his hands inspired him to learn origami through this program.